Meg and Chris tied the knot during their Leu Gardens wedding in Winter Park, Florida. Envisioning a day filled with a little bit of everything they love, the two incorporated some of their favorite comics as table decor, Meg’s bouquet and Wonder Woman headpiece, along with Superman cufflinks for Chris, mint and navy throughout their attire and table linens, DIY crafting with our favorite piece being the Funko pop! wedding cake topper, and most importantly their closest friends and family. Reddit, where the magic all began. Having met online through Reddit’s personal section, the two quickly realized how much they had in common and decided to meet for an official first date. The Cloak & Blaster, a gaming pub for geeks as Meg puts it, was their location of choice. Enjoying a few drinks over hours of conversation about their mutual love of bad movies, sci fi, and comics, it wasn’t long into their first date that Chris knew he had to see Meg again. Falling in love at first sight with Meg’s eyes and smile, Chris also fell in love with how she can make him laugh. For Meg, it is how Chris can always bring calm to the storm and mellow her out even when most stressed. The two knew they had found something special, and during their vacation getaway to Savannah in April of 2018, Chris planned out his proposal. Enjoying a hike in Skidaway Island State Park, Chris let Meg walk along a little bit before him when she stopped to take a picture of the tree clearing they had come upon. Turning back to see where Chris was, Meg was in shock to find him down on one knee with an engagement ring in hand. A man of few words, Chris said, “well babe, will you marry me?” Of course, Meg said, “yes!” and the two celebrated that evening in downtown Savannah. 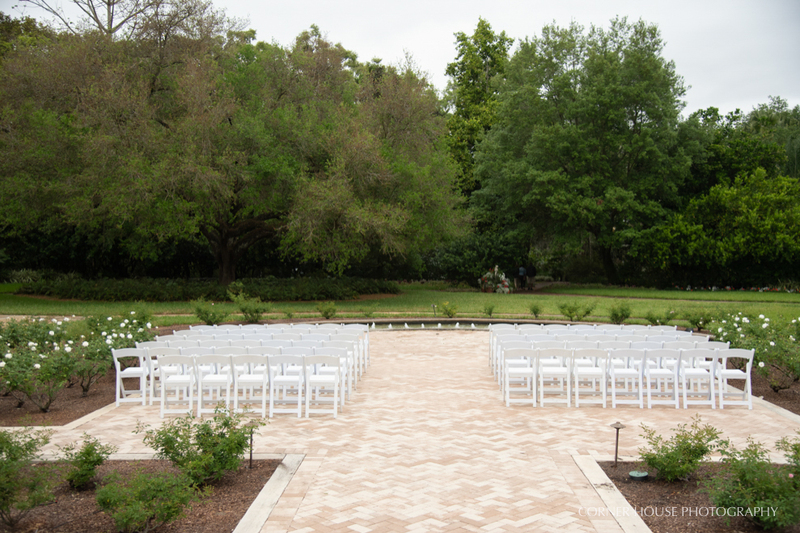 While Savannah set the scene for their engagement, Leu Gardens was the backdrop for their wedding day. Absolute lovers of the lush garden, the two knew they just had to tie the knot at Leu. Our day started off with Chris greeting us at the groom’s suite, and Meg soon following suit at the bride’s suite. Located behind the butterfly garden and next to one of my favorite walk ways with a gorgeous oak, it was the perfect location next to where we would be bringing them for their first look after getting ready. Excited to see one another, we positioned Chris along the long pathway for their first look. Walking up to Chris, he was absolutely ecstatic when Meg finally tapped him on the shoulder to turn around. Sharing time together before the big day really was about to begin, our soon to be’s were soon joined by their bridal party for formal portraits. Silliness is definitely the perfect word to describe our group. Each and every member truly cared about our couple, which you could see in how excited they were to be a part of their big day, along with willingness to walk back and forth on the path several times for the perfect photo op or picking Chris up in the air – haha! After formal portraits with our bridal party, we headed over to the rose garden to set up for our sweetheart’s ceremony. Led by their close friend Emily, the ceremony emphasized on the importance of love and the love Meg and Chris share for one another. One of our favorite moments came from a reading that Chris’ mom shared about marriage and love. After sealing the deal with a first kiss, our couple was off to await their guests at the edge of the rose garden for their receiving line. Funneling through, each family and friend was able to have a moment with Meg and Chris. Formal portraits with family took place back over by the rose garden, and afterwards we took our newlyweds on an adventure through the garden for newlywed portraits. Hitting up some of my most favorite spots – a towering oak tree lined path, butterfly garden, and front of the rose garden – the location options were endless. Heading inside for their reception, we were able to give our couple time back in spending time with guests during their cocktail hour before the reception entrance began. Announcements, toasts, and formal dances, were followed by dining and tons of dancing – always a good time when a few 90s classics are dropped by Roeshink Entertainment – and of course an awesome bubble send off to end our sweetheart’s night.